Takeaway: If there are people, there will be disagreement. Avoiding disagreement, or insisting on a ‘be nice’ Christianity does not solve the problem. Instead, we need to focus on disagreeing in love and with purpose. It is pretty easy to look around at the Christian world and see lots of people being examples the opposite of this prayer. It is not all that easy to find really good examples of how Jesus’ John 17 prayer is being fulfilled. I think in large part it is because movements toward unity are a lot harder than disagreements. It is often very slow gradual steps toward unity, but breaks in unity are often loud and well publicized. One of the best books I have read on the reason for this unity is John Armstrong’s Your Church is too Small. I have read it and plan on reading it again very soon. But I am looking for practical guides for how we actually accomplish Christian unity, not just broader books about why we should have Christian unity. I think it is a good sign that we are in desperate need of Christian unity, when there are virtually no practical books about how to accomplish it. So I read Randy Alcorn’s The Grace and Truth Paradox last week. 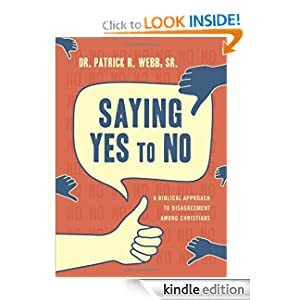 How to Say Yes to No is the only book I have found that is explicitly about disagreement among Christians. There has to be more, so if you are aware of anything please let me know in the comments. How to Say Yes to No is a very brief, and fairly basic guide to how to disagree as Christians. The book opens with why we should have disagreements (if we care about someone, then we will have disagreements). There is a clear case against sweeping things under a rug or ignoring them. While I agree that serious matters should not be ignored, I do not feel like there is a clear case for what things rise to the level of having a disagreement. Yes I know you can be irritated about the color (or the process for choosing the color) of the carpet in the church sanctuary. And I know that many church splits have occurred over similar minor issues. But there is no real guidance in this book about how to think about the disagreement’s level of importance. This book makes the assumption that all disagreement can serve one of three purposes: 1) a means of testing of our faith, 2) a means of humbling us, or 3) a catalyst for our spiritual growth. I would say good disagreements serve that purpose. But we need to acknowledge that some disagreements only serve to tear down the church or our faith. There is an example of a disagreement in the bible where Peter telling Jesus that he will not die, and Webb walks us through how that disagreement meets the purposes. But I want to hear a discussion about the disagreement between Peter and Paul over eating with Gentiles. Or about the disagreement between Paul and Barnabas over Timothy. Or about the disagreement between Paul and the Judiazers that resulted in Acts 15. Or about the 1 Cor 11 where people were disagreeing over following Paul or Apollos or Cephas or Jesus. There are many examples and none of them were discussed. There is some good practical advice, however. Once there is a disagreement, Webb says, we need to start with what we agree about. So when the author of Revelations writes to the 7 churches, he first talks about what they are doing right. Webb says this is important, both because it defuses tension and because it emphasizes that we are still related through Christ. Unfortunately, there is not much more than that. One of the most frustrating parts of reading this book is that it only used King James Version scripture quotes. It is a new book, there just is not a good reason to obscure the message of the book by quoting only KJV. There does not seem to be any theological reason in the text for a KJV only. So I was a bit annoyed. This book was ok, and I only spent $5 on it. But it was not really all that useful, except to show that more useful books are desperately needed.